Bass are one of, if not the most popular fish in the Americas. Not only are they incredible fighters, but at least one species of bass can be found in almost any body of water from Canada, throughout the U.S. and into South America. Although not near as popular as bait casting and spin fishing, one of the best thrills in fishing is catching bass on a fly rod. Before you can do this though, you will need a Bass Fly Fishing setup. Here we will discuss the aspects that should be taken into account when choosing the best fly rod for bass, which is not as straight forward as it sounds! Bass come in many different sizes, strengths and species, and require different techniques for different situations. Let's take a look at these aspects and then you can go through the link at the end to my website where we will talk more about brands and models of fly rods for bass. Size: what weight fly rod will be best for Bass? Bass come in all different sizes that vary widely with respect to species. The species not only determines size, but also strength. For instance, a Small Mouth Bass has the ability to put up as much fight as some fish twice its size. This needs to be taken in to account when choosing the best fly rod for Bass. All bass start out small, but can grow to large sizes. Therefore it is suggested that you go with a bass fly rod that is designed for the larger end of the spectrum. You will not want to be weak in back bone when you need it. Here is a generic list of species and the weights that are recommended for each. Rod Action: determines how a rod casts. When fly fishing for Bass, typically you will be using heavy flies that will take some back bone to get out of the water and to get any distance. A stiff, fast action fly rod will be able to best cast weighted flies, sink tips and wind catching poppers. If you go with a rod that is too soft, you will be struggling to get the fly out of the water. Bass can be fished with many different methods. Different types of line will be needed to cover all tactics. For instance, when using top water poppers, a floating line will be needed. When using bait fish imitations, a sinking line will be the best to get the fly to the fish. For this reason it is best to use a line that can be used for multiple situations, which is a line that has interchangeable tips: floating with multiple sink tips for different sink rates. For more information on lines, follow the link at the end of this article. Rod quality ranges widely. With increases in quality, obviously price will increase. There is a wide range in prices from the cheap Wal-Mart combo setup at $40 to a high end $700 dollar rod. There are two criteria I suggest everyone stick with for any rod for any fish. Number 1: buy the highest quality rod you can afford. Number 2: Make sure any rod you purchase comes with a lifetime warranty. To get a rod with a lifetime warranty, you will need to spend at least $200. It may sound like a lot, but it is worth it when you figure you will be making an investment to last a lifetime. You have probably broken a rod or several in the past, and most likely it will happen again whether it be on a fish or your car door. When choosing the best fly rod for bass, remember that you will be using hard to cast flies, so you the better the rod, the easier time you will have. Those spendier rods do work hard and are worth it if you can fit one into your budget. Several rod makers build rods that are designed for bass of all species. There are many different sizes to choose from, and they do get expensive, so you will want to make sure you go with the right Bass fly rod the first time. 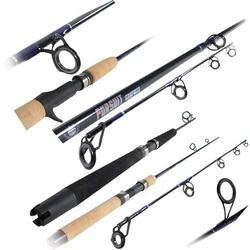 To narrow your search down to specific brands and models click here: www.OnlineFlyFishingGuide.com and then click on rods. Then click on the rod size that will best fit your situation. Click here to go to The Online Fly Fishing Guide. There is an art to approaching a stream that you have never fished before, and truthfully, fine art is not created by beginners. However, any art student begins with certain fundamentals and then creates his or her own techniques by building on these fundamentals. I would encourage the reader of this article to look into other advice beyond that related here to devise his or her own approach with which they are comfortable. This is how the author advises those whom are new to the sport and are fishing a new area and looking for a methodical approach. Know as much about the trout stream as you can. Know what hatches may be occurring at various times of the year. Know which species of trout are present. Try to develop a knowledge of fly types that work on the water you will be fishing. Whether streamer flies, nymphs, or dry flies, try to get as specific information as you can get. Know specific colors and sizes and have as many of those sizes as possible. This information is available on the internet through regional forums as well as traditional websites (see resource box below). Also, local fly shops are a great source for information and doubly so if you have the courtesy to actually make a purchase relevant to the advice you receive. This is kind of analagous to hiring a fishing guide. You may pay a bit more for your purchase the first time, but you then have gleaned the information you need to make future purchases via discount retailers if you so choose. You cannot go splashing into the water and start looking around for a good spot to fish. Reading the water is best done from a short distance back and is not a snap decision. If the water is clear enough where you can site fish, this means they can see you as well. You may have to make a crawling approach at times. You need to make a decision based on your own skills. Great water with an overhanging bush is not an option if you cannot roll a cast into this water. Depending on what you will be fishing, dries or nymphs/streamers, make a wise decision on the water you will fish. If you will be fishing dries, and you are a beginner, consider a slower current stretch where you can get a longer drift before drag starts to affect your line. If you will fish pocket water, think about drifting your offering into the pocket in the manner the current will naturally bring food downstream. This is usually done while fishing nymphs. Whether you use a strike indicator is a personal decision, but may be helpful for the beginner to detect strikes. I am not a dry fly purist. I enjoy most catching fish that have risen to a dry, but if the fish are not rising to a hatch, I have no qualms about fishing below the surface. In fact, generally speaking, I fish streamers and nymphs unless I see a reason to switch to a dry. Once trout begin rising to feed, then I will usually switch to a dry. However, there are even times, say when there is an enormous hatch and very few fish are rising to feed, when I will stay with the streamers and nymphs. If there are millions of critters landing on the water and only a few fish rising to them, what chance does my one elk hair caddis or adams fly have? 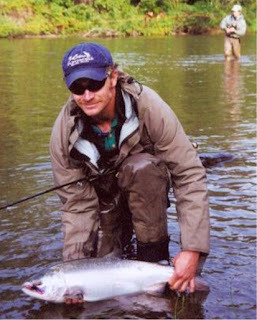 Often, I will begin fishing the early part of the day with nymphs and streamers in pocket water and deep pools. Often I will switch quite a few times and then hit on something where every drift is eliciting a take. When this stops producing, I assume that the fish gods have told the fish to stop biting, stop biting that fly, or I have sufficiently disrupted that stretch of water. I will usually try a few additional offerings, and if I have no success, move to a new stretch of water. As evening approaches, I am particularly alert to hatches and/or rising trout. There is nothing more satisfying than a take on a dry. 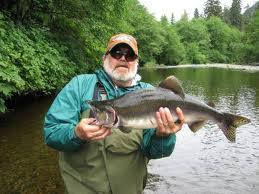 If possible, be able to identify the hatch and/or what the trout are rising to, and as they say, "match the hatch." Sometimes a rough facsimile of the hatch will suffice if an exact match is not at hand. Be willing to experiment. Often, very subtle differences matter. Even for an experienced fisherman, a new body of water can be a challenge. If you are pretty sure that the stream holds fish, be willing to go back a few times even if at first you do not have success. Just like your casting skills, your other fishing skills will build over time, and there is a lot of satisfaction in becoming well versed in a certain body of water. We hope the tips serve you well. Fly fishing has been well known as a great method for catching trout for many, many years, but what if you are a trout fisherman who doesn't fly fish? If you don't fly fish, you are probably under the impression that fishing with flies is not a possibility for you. This is actually not the case and this article will explain a very effective trout fishing technique for fly fishing without having to use fly fishing gear. The entire act of fly fishing has always seemed like too much of "a production" to me to be a viable fishing alternative, but using artificial flies for fishing (and for trout fishing in particular) has always intrigued me because of their obvious effectiveness. The bottom line is that fishing with artificial flies can be accomplished without the use of traditional fly fishing gear, and the answer lies in the use of a casting bubble. 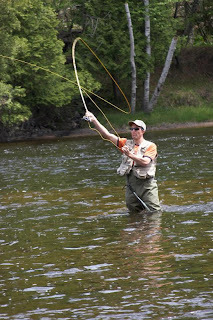 Using casting bubbles as a way to fly fish while using traditional spin fishing gear is an excellent trout fishing technique for any serious trout angler to add to their fishing repertoire. A casting bubble is simply a small clear "bubble" (much like a bobber) that slips onto your fishing line providing weight for casting lightweight flies. The "bubble" is then retrieved slowly with the fly to tow. Casting bubbles can be used to fish both wet and dry flies effectively. Casting bubbles are easy to use and an excellent fishing technique to learn and employ for many species of fish, but especially for trout. When using a casting bubble and fly it's very important to be able to see not only the bubble itself while it in being retrieved, but in some cases the fly itself as well. This is why it's important to wear a quality pair of polarized glasses when using this trout fishing technique. Polarized sunglasses cut through the glare and refraction of the sun as it reflects off of the water. Being able to see what's going on with your casting bubble and fly are very important, so a quality pair of polarized sun glasses are also very important when using this fishing technique. The bottom line is that using a bubble to fish with a lightweight fly works and is an excellent technique to learn and have available when fishing for trout. If you've ever wanted to use flies as bait, but don't like the idea of "fly fishing" a casting bubble is the technique for you. 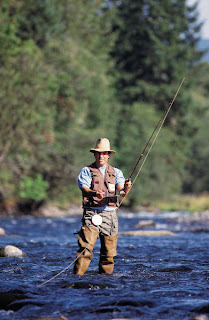 It is the only way to go "fly fishing" without using traditional fly fishing gear. If you are planning to engage yourself in fly fishing, you will need a lot of parts and accessories. You will need to take them with you, and the best way to do this is with fly fishing vests. These vests have huge number pockets where you can put away all your gear such as flies, lines, weights, etc. 1. What weather conditions dominate in the area where you will be fly fishing? 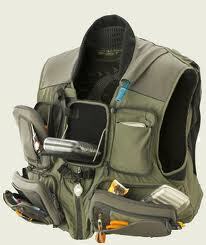 Weather and temperature are two important factors when it comes to buying your fishing vest. Get a mesh vest that is more ventilated if you will be fishing predominantly in warm weather conditions. For colder weather, buy a vest that is large enough to allow for layers underneath! 2. Fly fishing involves doing a lot of wading in water. For this reason, it's better to purchase a vest with a short waist. This way, your equipment will be above the waterline so you will avoid damaging it. 3. Take into consideration how much you will be taking with you. Large number of pockets is fantastic, but if you fill all of them up with equipment that is not necessary, you are going to weigh yourself down. On the other hand, try to find a vest with different sizes of pockets to hold the different things you will be taking with you. 4. It's very important that you can easily open and close the pockets in your vest. If at all possible, you should be able to do that with just one hand. Fly fishing vests that come with Velcro to seal pockets are the best option. It's a good idea to buy one with a "D-ring" on the back where you can put your net. 5. Once you fill your vest with the equipment you plan to carry with you, make sure that you can move easily. If you are weighed down too much, casting will be extremely complicated. 6. Vests are available in a variety of colors, and you will want to choose one that blends excellently with the vegetation of the area you will be fly fishing. Tan is recommended for fishing in the West and green will tone with the plant life of the East. 7. This last tip is very important. Get a vest with hardly any places where your line can get caught during casting. Lines and leaders often get caught on things that stick out on your vest such as fly patches, zippers, sunglass holders, etc. Locate a vest that you can afford that meets these basic guidelines and you are ready to go. If you have ever wanted to fish with artificial flies but don't necessarily have an interest in going to the time and expense of learning to fly fish you need to be introduced to the world of fly fishing bubbles. Fly fishing bubbles are the best way to fish lightweight flies without having to use traditional fly fishing gear. In this article I will outline how to use a casting bubble to fly fish. Fly fishing bubbles have been around for a long time, and if you aren't familiar with them they can appear to be a traditional bobber. While a fly fishing bubble may look like a bobber, it is actually quite different. You see a fly fishing bubble is threaded onto your fishing line and "floats freely" on the line itself. The bubble is "stooped" by tying a swivel onto the end of your line. The bubble is then help underwater and "opened" to allow water into the bubble itself. Adding water to the bubble gives you added weight for casting. In normal situations when you want to fish on the surface of the water the bubble is filled three quarters full of water. Fly fishing bubbles are most productive when fished in still water situations like lakes or ponds. Although this method of fishing flies can be done in rivers, it takes practice and shouldn't be attempted by a fisherman with little or no experience. For the beginner, the use of fly fishing bubbles should be reserved for lakes and ponds. Using a casting bubble to fly fish is actually quite easy. The rig is set up like this: Thread the bubble through your fishing line with the thinner end of the stopper pointing towards the end of your rod. Now tie on a swivel act as a "stopper" for the bubble itself. A tapered leader is now added to the opposite end of the swivel and a fly is tied to the end of the leader. At this point the stopper is depressed on the bubble itself while holding it underwater. Once the bubble is three quarters full, close the stopper. This rig is now cast into the water and retrieved slowly. When it comes to fly fishing bubbles a slow retrieve is normally best, although varying the speed of the retrieve can be effective as well. Experimentation is the key to success when it comes to fishing flies in this manner. If you would like to fish with wet flies rather than dry flies, your bubble should be filled completely with water. This way the bubble will sink under the water after being cast out. A bubble, when full, will sink approximately six inches per second. The bottom line is that you now know how to use a casting bubble to fly fish. Now it's time to get out there and start experimenting. There is little doubt that with experience, this method of fishing will become one of your favorites. Artificial flies are effective for many species of fish from trout to large and small mouth bass and now as a traditional spin fisherman you know how you can fish effectively while using artificial flies. In this article I'm going to reveal some secrets about both fly fishing lessons and fly fishing tools. Fly fishing is a unique sport in both the fact that you can make some of your own equipment and that it is a sport that no one truly masters. The unique properties of the sport make it a life long enjoyment for those that fly fish. Unlike other styles of fishing where one has perhaps a favorite lure or bait that always seems to work, fishing with flies is actually a daily experiment that encompasses learning which flies are working, what depth the fish are feeding at, and where exactly should you be casting that day. If the fly fisher has to figure all of that out every time he hits the water one might wonder why anyone would bother with fly fishing lessons. The answer is quite simple: learn from other's experience. Even though successful fishing with flies requires making constant changes in your tactics an experience fly fisher can tell you how to narrow down the choices before you to a small selection of techniques that are most likely to work that day. Good fly fishing lessons should not just cover basics like tying your leaders and at what depth you should start at but also cover how to recognize feeding patterns in the water, where to find the best places to cast and the life cycles of local insects. This style of fishing is truly more of a science than it is a sport, and good fly fishing lessons need to originate from that position. The scientific aspect is also what draws many fly fishers to creating their own flies. Using fly fishing tools to make your own flies is in some circles considered the mark of a real fly fisher. Just like paying for fly fishing lessons won't make you an expert fisher, neither will buying fly fishing tools make you an expert fly tier, but there are a few things to be learned before you begin. First off; quality is way more important than quantity. A few select quality fly tying tools are preferable to an entire box of tools of questionable quality. A great fly tier can do his work with just five items: a vise, scissors, pliers, a bobbin and some epoxy. These five items should be of the highest quality. Before you can even begin to tie flies you'll need a good vise. A vise without good clamps will become useless very quickly. Once it is no longer able to hold your hook steady while you add feather, fur and thread it will need replaced. Much better to buy a high quality vise upfront that will last you a life time. With your hook firmly secured in your vise the fly fishing tool that gets the most work will be your pliers. You'll want a set of hackle pliers, that remain closed in their normal position, so that they can be used with the least amount of effort. A good pair of hackle pliers can also do the work that many use forceps to do. To complete your tool kit you'll need a good pair of scissors and a high quality bobbin. I recommend a 4 or 5 inch pair of scissors and a bobbin with a very smooth tube and adjustable tension. If you're only buying one pair of scissors initially, you'll want to make sure they come to a point so they can be used in close work. There are lots of other tools that you can buy but these basic tools, when bought of good quality, will handle most of the work that needs to be done. Add some good epoxy to keep everything together and you have the making of a very good beginner or even advanced fly tying tool kit. Even though this style of fishing takes years to master I hope that these few tips will help you get on your way. There is much more to learn, more information than even hundreds of articles like this could hold, but these secrets should get you started in the right direction. Fly fishing is a tricky way of catching fish. Before you visit a store to buy a fly rod, take these things into consideration. These are very important factors in fly fishing, so read carefully. The first thing to keep in mind is the kind of fish you will be catching. In general, the heavier the fish, the heavier the equipment will be needed. The second factor you need to think about is the body of water you plan to fish. For example, is it going to be a babbling brook, and a roaring river? The motion of the water is not the only thing to pay attention to. You also need to consider the clearness of the water, the wind and the distance you will need to cast to catch your fish. Finally, you must take into account the action of the fly fishing rods. They are made to flex; and they do it in different ways. They can be slow or fast. It is crucial to get the feel of the rod. If you are a beginner, a rod somewhere in the medium range would be the best option. 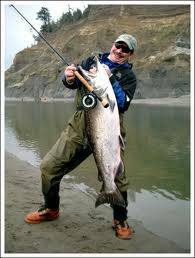 Experienced anglers, who have been enjoying fishing for many years, typically have quite a few different fly rods. Each rod is designed to do a particular job. The size of the different rods is represented by a number. The larger the number the larger the rod. It also represents the line to be cast. For instance, a 3-weight rod can cast a 3-weight line. Always keep in mind that the rod is just a continuation of your arm. It is the line that gets cast not the rod. You also need to take into account the weight of the fly. If the fly is too heavy the line will sag and will not cast as desired. An additional feature to care about when buying a rod is the flexibility or the action of the rod. If you get a fast action rod, expect that only about 30% of the rod will bend. On the other hand, a slow action rod will bend about 90%. A medium action will bend about 60%. The slow action rod bends much easier than a fast action rod. However, the fast action rod casts farther than a slow action rod. Today's best fly rods are made of the graphite. The introduction of the graphite enables the production of the faster action rods. These rods are not heavy and use more of the tip to project the fly line. The rod will do all the work for you if the line is cast properly. It is one of the biggest benefits of the fast action rod - the fisherman casting does less work. In the end. Never buy a rod that you have not cast first. There is nothing more relaxing and enjoyable than to go fishing. To have a bountiful catch, you need a good boat. Check out these superb inflatable pontoon fishing boats. Also, cold feet forces people to stop fishing. This is sad because it really is not necessary with heated boot insoles. With them, you can fish all day even in very cold waters.